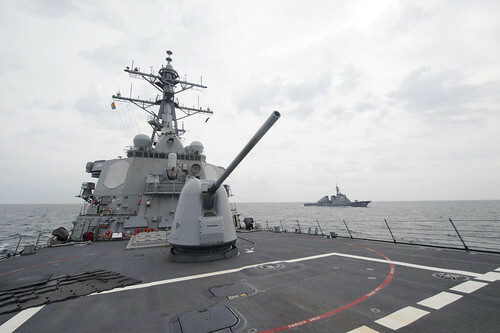 YOKOSUKA, Japan - U.S. Navy ships are conducting simultaneous bilateral maritime exercises with the Republic of Korea Navy and with the Japan Maritime Self-Defense Force, April 25-26. The destroyers USS Wayne E. Meyer (DDG 108) and ROKS Wang Geon (DDH 978) are conducting combined maritime exercises in waters west of the Korean Peninsula while the destroyers USS Fitzgerald (DDG 62) and JS Chokai (DDG 176) execute combined maritime exercises in waters west of Japan. Both exercises demonstrate a shared commitment to security and stability in Northeast Asia as well as the U.S. Navy's inherent flexibility to combine with allied naval forces in response to a broad range of situations. Wayne E. Meyer is on a regularly scheduled Western Pacific deployment as part of the Carl Vinson Carrier Strike Group and the U.S. Pacific Fleet-led initiative to extend the command and control functions of U.S. 3rd Fleet into the Indo-Asia-Pacific. Forward-deployed Fitzgerald is part of Destroyer Squadron 15, which operates from Yokosuka.